In some ways, the Rockets’ 119-100 victory over the Timberwolves and the 50-point third quarter that fueled it were an unpleasant inevitability. Houston is the No. 1 seed for a reason and had one of the most efficient regular-season offenses this season for a reason. The Wolves had spent three-and-a-half games of their playoff series playing reasonable defense, but the Rockets had also been missing a lot of open shots they usually make for no good reason other than the law of averages. Any team that has aspired for a while to achieve a 50-point quarter, as coach Mike D’Antoni said has been a stated goal of his Rockets, is capable of such things. There is, too, the predictability of the rhythm of a seven-game series between a clear favorite and an underdog. The Wolves put a scare in the Rockets in Game 1 but lost. Houston routed the Wolves in Game 2. The series shifted back to Minnesota for Game 3, where the Rockets exhaled and the Wolves dug in. Fueled by the home crowd and inspired play, the Wolves grabbed a convincing win. Now if the Rockets win back in Houston on Wednesday, the series will have followed the exact pattern of the Wild’s five-game exit. It’s an arrangement known in some circles as a “gentleman’s sweep,” whereby a superior team doesn’t exactly let an opponent win a game but does step off the gas long enough to make it possible because there is not a genuine worry about losing the series. The better team then cruises to a 4-1 series win, closing things out at home in Game 5. Minnesota had done enough in the first half of Game 4, though, to create genuine optimism throughout Target Center. Karl-Anthony Towns missed most of the first quarter with two quick fouls. Jeff Teague was banged up and ineffective. And yet there was the halftime score: Houston 50, Wolves 49. And then … the Wolves came out flat to start the second half, with Karl-Anthony Towns decrying their lack of energy and grit postgame. From there, with every 50-50 call that didn’t go their way, frustration mounted. 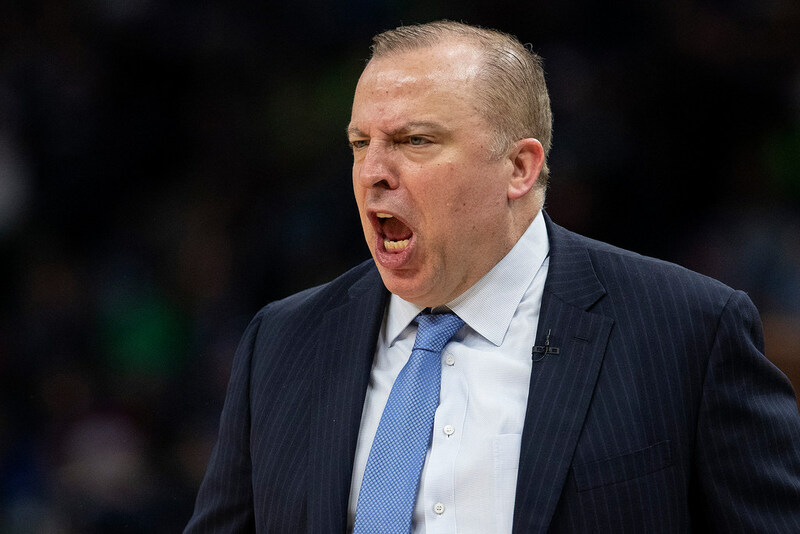 Wolves Tom Thibodeau, who works officials with vigor, grew even more agitated during that stretch and his team followed suit. Fans picked up on the energy, and it took all of six minutes of game action to completely change the mood and outcome of the series. If a lack of energy was to blame for a slow start to the third quarter, a lack of poise played perhaps the biggest role in turning a Rockets run into a Rockets runaway. Afterward, D’Antoni talked about his team’s “spirit” and joked that people might need to “check their tweets” if they ripped James Harden at halftime after a slow start to the game. His mood — perhaps understandably so — was in stark contrast to that of Thibodeau. The Wolves coach looked particularly crestfallen after the game. He offered that. “It’s the first team to four (wins), so we have to respond,” but neither he nor his players had many concrete answers as to how Houston was the first to 50 in the third quarter. Reporter: Can you talk a little bit about the sub rotations in the third quarter? (No response) In terms of the third quarter, the rotations for subbing? (No response) Derrick Rose was out quite early in this game. Dou you feel like you had a good handle on your sub rotations? Thibodeau: I don’t understand the question. Reporter: Like the rotation of players that were subbing in and out. That was the end of the postgame news conference and a night filled with more questions than answers. Poll: How many games will the Wolves-Houston series go?